Valve's Jeri Ellsworth is on the lookout for exiting new projects. It's unsettling news from Valve's vaunted hardware shop: Jeri Ellsworth, one of its premier techies, is out the door. 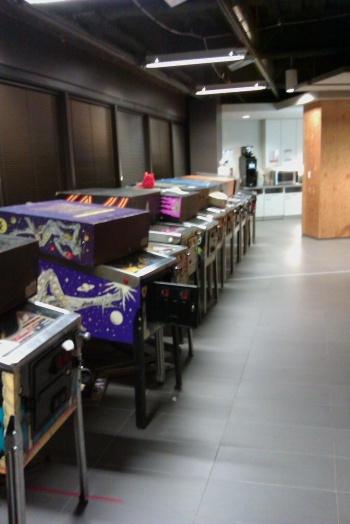 The pinball machines - part of Jeri's extensive collection - are in mourning; soon they'll be packed up and shipped out of Valve's corporate offices. Only last September, Ellsworth was reported as working on bringing Valve's hardware into your living room. It's still not entirely clear what Valve hopes its hardware division will achieve; it went into hardware production because it was frustrated with the lack of innovation in the market, and Ellsworth - a renowned tinkerer - was one of Valve's most visible hardware people. In fact, she's pretty much the reason why Valve has the hardware lab that it does. When the New York Times did a piece on Valve last September, it was Ellsworth who took the Times on a tour of the lab Valve had built, when it hired her. "At one point, I said a hardware lab could be very expensive, it could be like a million dollars," Ellsworth recalled, to which Gabe Newell responded, "That's it?" No word yet from Ellsworth, or Valve, as to what happened, or what this might mean for Valve's hardware shop. Update: unconfirmed reports suggest that the hardware and android projects division has suffered considerable staff layoffs; perhaps as many as twenty five jobs lost in all. Jason Holtman, Valve's business head, is also said to have left the company. Though there has been no confirmation from Valve, Holtman is no longer listed as an employee on Valve's staff page.